Just a few miles west of Gallup, NM., nestled among the canyons & hills of the small town of Lupton, AZ., lies the quaint, cozy workshop of the young Navajo artist, Alvin Yellowhorse. 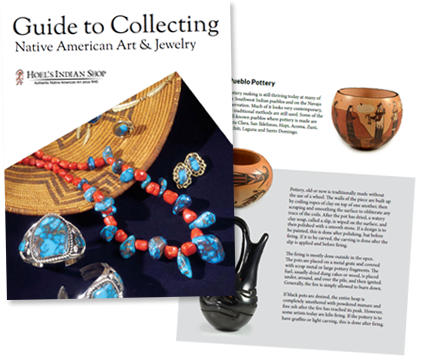 Alvin learned the silversmithing trade at an early age from his father, Frank Yellowhorse, and later mastered the techniques of cutting the small turquoise & other colorful stones into precise little pieces in which he assembles into intricate designs inspired by his Anasazi ancestors. This technique is called “Channel Inlay”. A style of inlay where all the stones are cut & assembled together first & then ground flush before being highly polished. Alvin is credited for originating another style of inlay called “Corn Row Wave Inlay” in which the stones are individually cut & rounded over before setting them into a silver or gold bracelet, pendant, ring, or link bracelet. Corn Row Wave Inlay is much more time consuming as he has to completely finish each stone one at a time before placing them into the gold or silver setting. Alvin creates each piece one at a time . There are no mass production techniques or assembly lines. His designs, although very contemporary, are enriched by the Zuni, Hopi, & Anasazi influences along with his own Navajo heritage. Alvin also receives inspiration from the ancient petroglyphs found along the canyon walls near his workshop. Alvin is forever amazing the jewelry & art galleries with new designs & techniques. Aside from being featured in several high-end galleries, Alvin was recognized by the Smithsonian Magazine in their August 1999 issue, along with Art Book Arizona Magazine doing a profile on his life. Each year Alvin enters his jewelry into the Santa Fe Indian Market competition & has won several Blue Ribbons.